Alan Strange reviews a greatly expanded new edition of Richard Muller’s Dictionary of Latin and Greek Theological Terms. This is a treasure chest of theology drawn from post-Reformation (Protestant Scholasticism) theology. It’s a pity that it is published in paperback. Darryl Hart reviews a fascinating book on the American chaplaincy, Ronit Y. Stahl’s Enlisting Faith: How the Military Chaplaincy Shaped Religion and State in Modern America. This topic is a third rail for Evangelicals, who are often confused about the American establishment of religion, wishing on the one hand to keep the government out of church business, yet on the other hand forgetting that chaplaincy is an establishment of religion despite what the First Amendment says, as Hart points out. I review Alan Jacobs latest book, How to Think: A Survival Guide for a World at Odds. Jacobs challenges us to think more carefully and thus considerately in order to better navigate the divisive terrain of modern American culture. Finally our poem this month is by a little known colonial poet, Edward Taylor (c. 1642–1729). After arriving in the American colonies from England he was graduated from Harvard, and went on to become the pastor of the Congregational Church in Westfield, Massachusetts, where he ministered until his death. His poems remained unpublished at his request for more than two-hundred years. In 1937 Thomas H. Johnson discovered a 7,000-page quarto manuscript of Taylor’s poetry in the library of Yale University and published a selection from it in The New England Quarterly. His complete poems, however, were not published until 1960, by Donald E. Stanford. Taylor has been compared to the Metaphysical poets George Herbert and John Donne, and is considered the greatest poet of the colonial era. 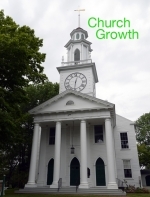 “The Church Growth Movement.” (Martin Murphy) 8:4 (Oct. 1999): 76–77.